I know, right...it's purple. I have been trying to step outside of my normal savory use of tofu and this was my first trial of a sweet pudding (no cooking). I am happy to say that I really liked it (the illustrator like it too)! I was a little afraid at first, but with an open mind...I dove in. This is definitely not going to be my last experience with tofu pudding. The tofu flavor definitely mellows out when you let it sit in the refrigerator for a couple of hours and let the other flavors infuse in the tofu. I like that you can make it as sweet as you want it to be depending on your mood. I realize this is not a new thing and that there are many versions of tofu pudding out there, but this was my first adventure into the world of tofu pudding. My version for this one is very lightly sweetened, so I let the berries do their thing to make it fresh and sweet tasting. Add more sugar if your berries aren't sweet enough. Blend everything in a blender or food processor until smooth. Stop and scrape it down a couple of times while processing. Refrigerate for a couple of hours or more until ready to eat! To be honest, I ate the whole thing, but it could serve two. I can't wait to try this! I have all the ingredients in my fridge/freezer. It looks totally amazing. I love getting tofu into desserts where I can!! You should check out Phytopia cookbook. They have a dessert section in the book, which uses a ton of tofu! I too, can't wait to try this at home!!! 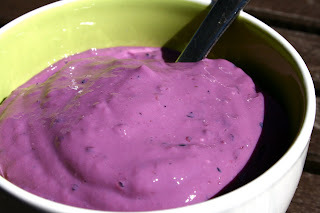 My daughter will love this: purple is her favorite color and she's always looking for new things to do with tofu! That looks so wonderful. I love the hue that dark berries give. Oh my god what a lovely color! !I love your blog layout-its awesome! Looks wonderful and interesting. It would appeal to kids, mine is allergic to milk.